When it comes to decorating for the seasons, I like to keep things very simple…favoring a look that’s natural and organic with minimal pattern and lots of texture. Since it’s starting to look and feel like autumn outside, I figured I’d try to bring a little bit of natural goodness to the indoors. Since there is more than enough acorns to feed the squirrel population at my parents’ house, I decided it was okay to gather up a bowlful of those little brown beauties to display in an old wooden bowl. Just as an aside, my dad said I shouldn’t have any problems finding some acorns…there were so many that it’s like you were walking on marbles. I thought that was funny. Anyway, back to my project…I didn’t do anything too fancy with them, just paired the whole thing with a few little hydrangea blossoms and sat it atop some French ledger paper on a side chair in my living room. Then, I cut a bunch of hydrangea blossoms, enough to fill that bucket I had in my living room, and set it up in front of the window. 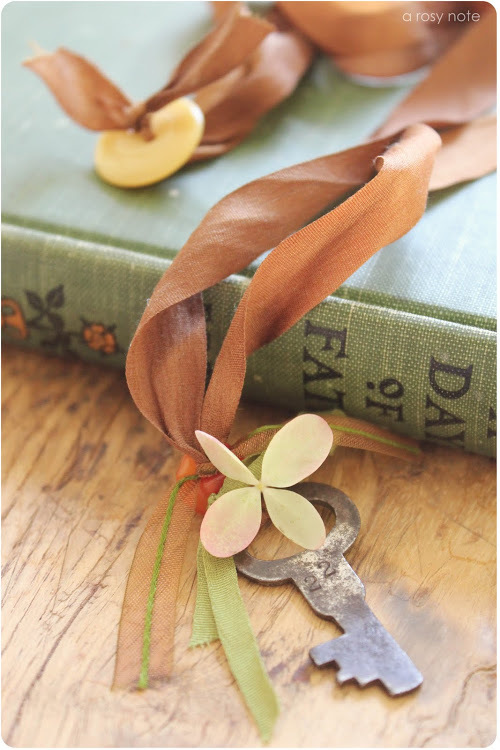 A vintage book and a silk ribbon in some fall-like colors sit on the stool for a little something extra. The more I kept looking at that bucket of flowers, I started to think about how good it would look on the dining room table. So of course, I had to try it out in there too. I just plopped a few pears next to it and called it done. I really like the way it looks, especially since that pie safe has the same finish. I’m thinking that I might have to rustle up another bucket somewhere so that I can have one in the living room and one in the dining room. You can never have too much of a good thing…right?! You know what else I’m thinking would look good in that bucket? Pinecones. I’ll have to remember that for Christmas. I really can’t believe that thoughts of Christmas are entering my mind…sad. Your skills behind the camera, WARM my heart! Thanks for sharing! Your simplicity in fall decor is just gorgeous! It's all so beautiful. Hi Tricia! I love your style of simple and natural decorating for the fall season! Everything looks so beautiful… Love, love your photos! I love your little touches! So simple yet stunning! I love acorns! such beautiful decorating, and those Hydrangeas are gorgeous! Oh, I wish I had an oak tree. Those acorns are just so darn cute! I was out in the cold "harvesting" my hydrangeas the other night, but it's worth it to have them brighten up the house all winter long. Once again, your photography is AMAZING! Beyond beautiful, Tricia! That corner of your room is so cozy and any way you style it, it always looks fabulous. The gray of the bucket and pie cabinet are awesome together in your dining room! 🙂 Oh, and you're not alone in thinking about Christmas. I'm on the prowl for grandkids' gifts already….lol! I love to log on and see a post from you! Doesn't fall give us the best gifts to decorate with…wish I could find some real acorns. Your simple decorating is beautiful and another bucket is definately in order…I love it behind your chair. It's so lovely for the start of the fall season. I like that it's not overboard with pumpkins and things since it's still September. When I look at your gorgeous dining room I just sigh and say "why can't my room look like that?!". Always such pretties here! Always enjoy your photography! So beautiful! I am ready for the fall decorating, too. I love all of your photos, you really capture it so beautifully. I was just looking at a bucket today. You're making me want to go back and pick it up now. I like your idea of fall decor. Natural and simple is the way to go. Can I just come live with you??? It's amazing sometimes how something so simple can make such an impact & be so beautiful! By the way, I used a bucket like this for pinecones last winter & I loved it. You probably will too. Tricia, Tricia, Tricia! 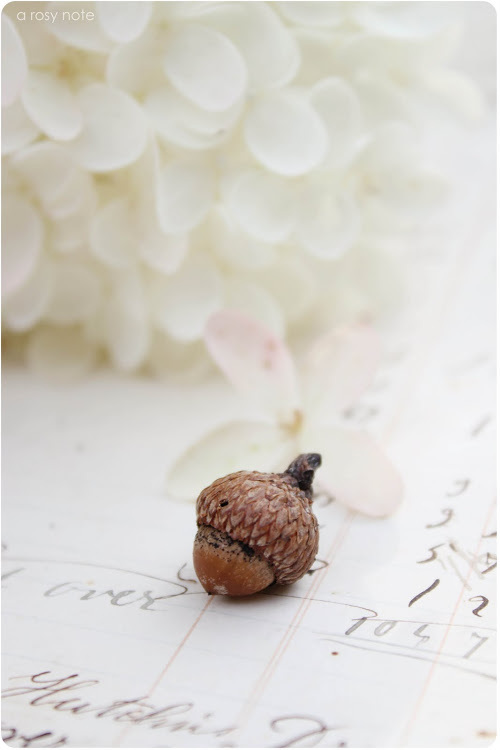 You are the goddess of creating and photographing interior decor and fabulous flowers (and nuts)! I can't imagine having enough hydrangea blossoms to fill a bucket with them! Just beautiful….all of it. Love your simple additions for fall. I like the natural things for fall decor, too. That is a great bucket of hydrangeas and the photo with the little acorn is my fave. you always know just how to charm us with your exceptional photo eye! seriously, these photos are breathtaking. just beautiful. your interior is pure heaven. Gorgeous……and why did you have to say Christmas?..LOL! I don't know where to start. I'm not sure what is prettier, the acorns or the hydrangea. The combination is breath taking. Always a nice & warm feeling viewing your photography! You make everything so beautiful & photograph it so well! I feel the same way about decorating with nature's gifts… I love to pick & pluck on my nature hikes. LOVE the first pic with the acorns – magical! And I love your dining table.. that is my favorite color wood.. like a pecan medium stain… gorgeous hydrangeas also Tricia! Happy Friday! Tricia, this is simply…AMAZING!! I always enjoy looking at your beautiful photos. Your dining room looks so…peaceful! Like, if you sat down to eat…you'd never want to get up! LOL! Love your fall decorating…so pretty! absolutely gorgeous. can i just climb through the monitor and relax in your beautiful home? 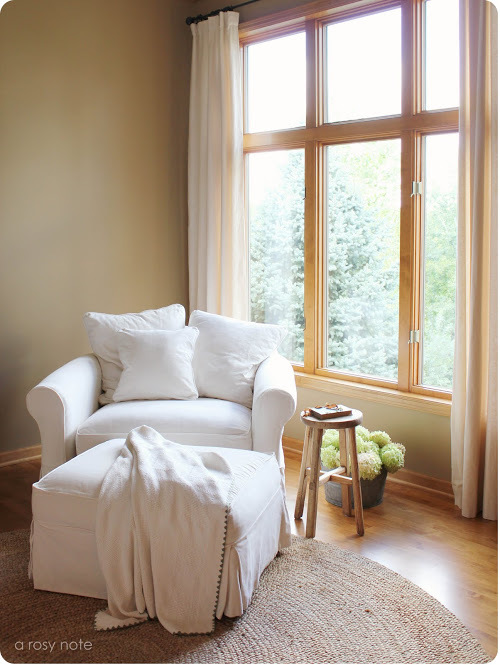 how I LOVE your house, your beautiful chair in front of the window! thank you for your inspiration and have a nice and sunny weekend! I love your style…Fantastically such beautiful pictures!!!! Tricia you have such a gift for capturing such beauty on your lens. 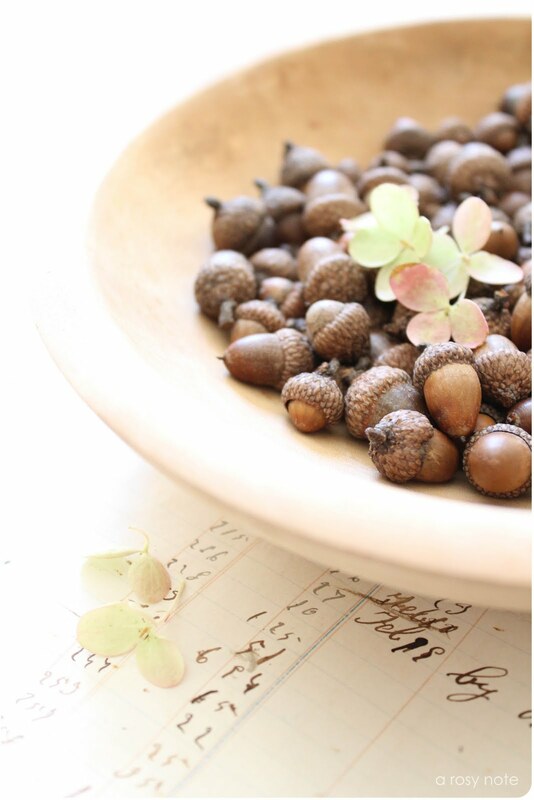 I have tons of acorns in my yard too and love to use them in decor for autumn too. Hydrangeas/ Dont get me started..adore them! Love your beautiful style and home. That's so funny, I was just spying my tree the other day full of acorns. They are still green and have not yet dropped. But I was going to collect some myself before the squirrels get them all. And if I had some clippers in my purse I would have take a bunch of hydrangeas that were at an estate sale I was at yesterday! Just perfect. Simply elegant in every way. I have a friend who wants to learn a little about photography and I told her about you. Oh Tricia how I love, love, love your style! You make it seem so effortless. You are such an inspiration to me – – beautiful photos as always and I love the hydragea's with the pears – beautiful. Your style is so beautiful! However, with 3 dogs, that white in my house wouldn't last 2 seconds! Very, very pretty! I love how simple and classy everything looks! Stunning photos! Tricia! I agree with the 1st comment…your skills are amazing. and I just love what you've done here. I would love to have you nearby to decorate my home!! Love the look you've put together here, and your photographs of it are beautiful as always! Tricia, again you do simple at it's elegant best. Enjoy the Fall. I love your photos! The flowers and acorn are so beautiful. Lovely decorating and beautiful photos!!! Wow, I really like the way it looks too, Tricia. I'm just not into a ton of bright orange etc. for Fall…this is very lovely. seriously, Tricia! You are such a great gesigner AND photographer! I love your photos and decorating ideas. Your photos and house are gorgeous! Full of natural beauty and light. Gorgeous! I wish I had your talent. I love the light airy feel of your home and you always add just the right touches. Isn't this time of year lovely when you can start to make everything more cosy and snuggly? I LOVE it!! Your close ups are some of my favourites in the world. Just stunning! OMGoodness, Tricia! Those photo's are so gorgeous! Keep on pressing that camera button and soon enough you'll become a star…. Lovely. 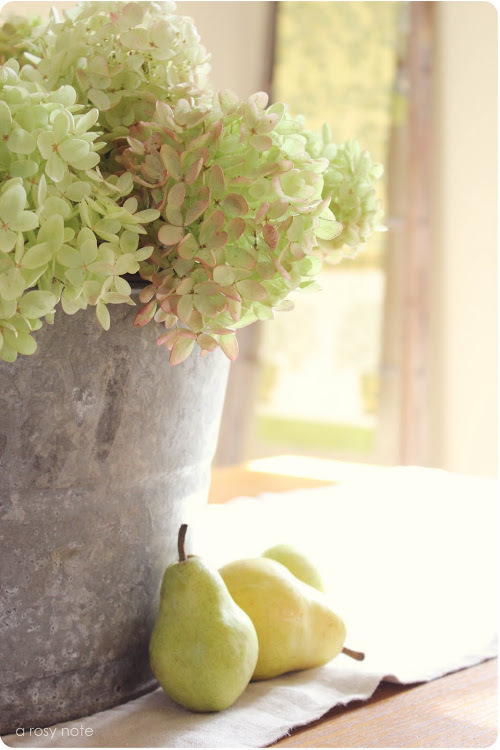 Love your simple and natural Fall decor! Gorgeous gorgeous post Tricia!! Your flowers in the bucket are wonderful and love acorns for fall decorating too~ your photos- AH-MA-ZING!!! Just beautiful!! So glad you are enjoying the book! I just love your dreamy shots.. Your simple decoration looks amazing.. Hope you have a dreamy Sunday my friend..
Hi Tricia! Wow! I love your photos! All of them look soooo beautiful! Simply awesome images and love the acorns. Hi Tricia…those pics were amazing! Your home is lovely:) I LOVE all the little acorns. Sweet touch. Dearest sweet tricia, i am so loving your gorgeous fall decoration. The acorns are soo adorable and i wish i could pick these up too but we dont have any here. Thanks so much for your beautiful fall inspiriation! Have a lovely merry happy monday and a beautiful week! Love to you! Hello Tricia! Oh my goodness your photos and decorating are so beautiful. I love the simple touches that you added. I have been catching up with some of your previous posts and that photo of your daughter holding the butterfly is absolutely perfect. How precious is she! 🙂 I am so glad that you got to enjoy the last days of summer and I am looking forward to fall as well. Your photos always take my breath away! So very lovely and serene! Such beautiful and simple touches to bring the fall season inside. I adore acorns. 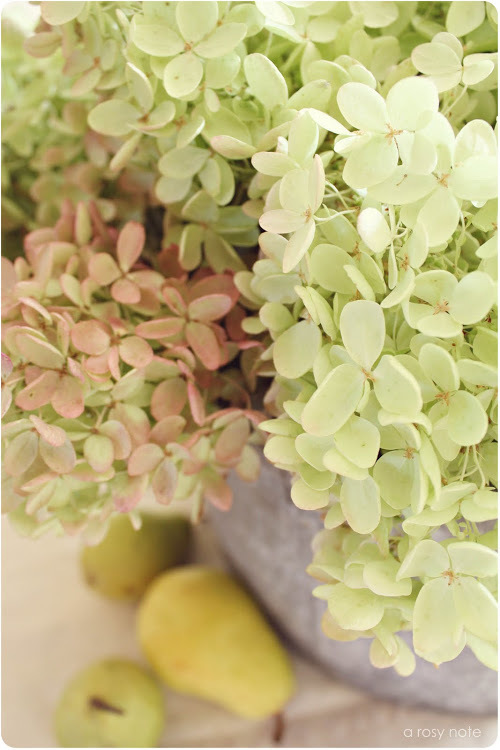 The hydrangeas in the rustic bucket are also wonderful. I love the idea of decorating with acorns and pinecones (mostly because they are free and hard to mess up when they're thrown in a bowl). What a lovely home you have. I love your decorating style. All those little touches really make a house a home. Tricia! Your style of simple and natural decorating for the fall season is excellent. Also those Hydrangeas are gorgeous. 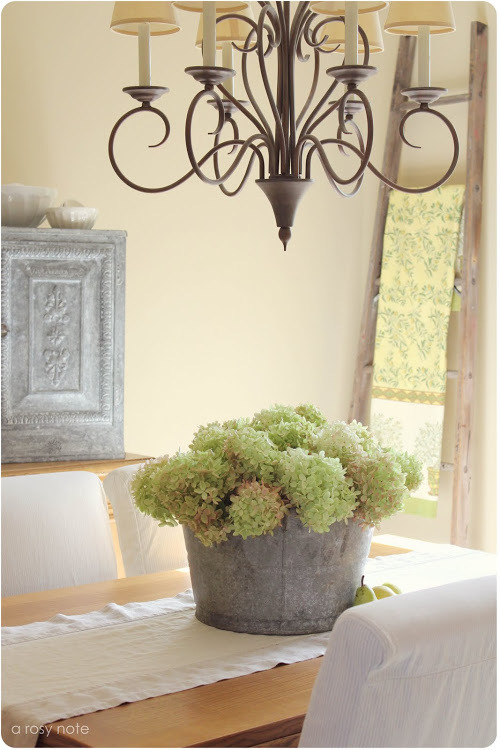 I love your bucket of hydrangeas…I just clipped some yesterday and love how they look in my home too. There's a Live Oak tree here that is supposedly over 1,500 yrs old and is considered the oldest living thing this side of the Mississippi and there are acorns galore underneath it too, and I have to be careful not to slip on the marbles myself lol. love your soft and classy photos! As I was on my walk this afternoon, I couldn't help but look at acorns in a whole new way! Thanks for the reminder that there is beauty in everyday things. Gorgeous…love it all…the bowl of acorns and the solitary acorn…adore!! never thought about putting acorns in a bowl but I LOVE how that looks – great pics! Oh I love your last photo of the simple little acorn. So pretty and simple. Love your simple ways of decorating, those pictures look like out of a magazine, gorgeous! I love your home, and your subtle fall decorating. You pictures are gorgeous! Your home is so absolutely beautiful! You have such a peaceful elegance….is that a style??? ( " "Yes, she transitioned from French Country to Peaceful Elegance! " Oh well, you get my meaning right!? Love your photog too! Love it, love it, love it all. Your photos and your aesthetic are beautiful, so I'm following!